Osmosis is the diffusion of water across a membrane in response to osmotic pressure caused by an imbalance of molecules on either side of the membrane. Osmoregulation is the process of maintenance of salt and water balance ( osmotic balance) across membranes within the body’s fluids, which are composed of water, plus electrolytes and non-electrolytes. An electrolyte is a solute that dissociates into ions when dissolved in water. A non-electrolyte, in contrast, doesn’t dissociate into ions during water dissolution. Both electrolytes and non-electrolytes contribute to the osmotic balance. The body’s fluids include blood plasma, the cytosol within cells, and interstitial fluid, the fluid that exists in the spaces between cells and tissues of the body. The membranes of the body (such as the pleural, serous, and cell membranes) are semi-permeable membranes. Semi-permeable membranes are permeable (or permissive) to certain types of solutes and water. Solutions on two sides of a semi-permeable membrane tend to equalize in solute concentration by movement of solutes and/or water across the membrane. As seen in Figure 22.2, a cell placed in water tends to swell due to gain of water from the hypotonic or “low salt” environment. A cell placed in a solution with higher salt concentration, on the other hand, tends to make the membrane shrivel up due to loss of water into the hypertonic or “high salt” environment. 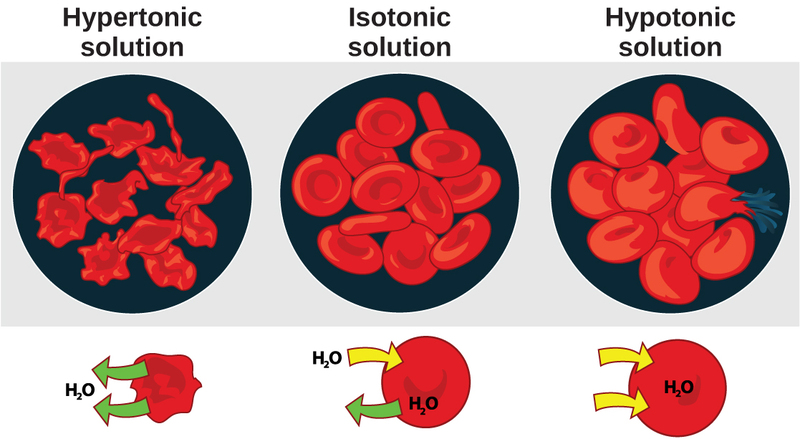 Isotonic cells have an equal concentration of solutes inside and outside the cell; this equalizes the osmotic pressure on either side of the cell membrane which is a semi-permeable membrane. The body does not exist in isolation. There is a constant input of water and electrolytes into the system. While osmoregulation is achieved across membranes within the body, excess electrolytes and wastes are transported to the kidneys and excreted, helping to maintain osmotic balance. Biological systems constantly interact and exchange water and nutrients with the environment by way of consumption of food and water and through excretion in the form of sweat, urine, and feces. Without a mechanism to regulate osmotic pressure, or when a disease damages this mechanism, there is a tendency to accumulate toxic waste and water, which can have dire consequences. Mammalian systems have evolved to regulate not only the overall osmotic pressure across membranes, but also specific concentrations of important electrolytes in the three major fluid compartments: blood plasma, extracellular fluid, and intracellular fluid. Since osmotic pressure is regulated by the movement of water across membranes, the volume of the fluid compartments can also change temporarily. Because blood plasma is one of the fluid components, osmotic pressures have a direct bearing on blood pressure. magnesium (Mg+2), and the anions chloride (Cl–), carbonate (CO3-2), bicarbonate (HCO3–), and phosphate(PO3–). Electrolytes are lost from the body during urination and perspiration. For this reason, athletes are encouraged to replace electrolytes and fluids during periods of increased activity and perspiration. the number of solute atoms or molecules and not dependent on the size of the solute molecules. Because electrolytes dissociate into their component ions, they, in essence, add more solute particles into the solution and have a greater effect on osmotic pressure, per mass than compounds that do not dissociate in water, such as glucose. Water can pass through membranes by passive diffusion. If electrolyte ions could passively diffuse across membranes, it would be impossible to maintain specific concentrations of ions in each fluid compartment therefore they require special mechanisms to cross the semi-permeable membranes in the body. This movement can be accomplished by facilitated diffusion and active transport. Facilitated diffusion requires protein-based channels for moving the solute. Active transport requires energy in the form of ATP conversion, carrier proteins, or pumps in order to move ions against the concentration gradient. In order to calculate osmotic pressure, it is necessary to understand how solute concentrations are measured. The unit for measuring solutes is the mole. One mole is defined as the gram molecular weight of the solute. For example, the molecular weight of sodium chloride is 58.44. Thus, one mole of sodium chloride weighs 58.44 grams. The molarity of a solution is the number of moles of solute per liter of solution. The molality of a solution is the number of moles of solute per kilogram of solvent. If the solvent is water, one kilogram of water is equal to one liter of water. While molarity and molality are used to express the concentration of solutions, electrolyte concentrations are usually expressed in terms of milliequivalents per liter (mEq/L): the mEq/L is equal to the ion concentration (in millimoles) multiplied by the number of electrical charges on the ion. The unit of milliequivalent takes into consideration the ions present in the solution (since electrolytes form ions in aqueous solutions) and the charge on the ions. Thus, for ions that have a charge of one, one milliequivalent is equal to one millimole. For ions that have a charge of two (like calcium), one milliequivalent is equal to 0.5 millimoles. Another unit for the expression of electrolyte concentration is the milliosmole (mOsm), which is the number of milliequivalents of solute per kilogram of solvent. Body fluids are usually maintained within the range of 280 to 300 mOsm. Persons lost at sea without any fresh water to drink are at risk of severe dehydration because the human body cannot adapt to drinking seawater, which is hypertonic in comparison to body fluids. Organisms such as goldfish that can tolerate only a relatively narrow range of salinity are referred to as stenohaline. About 90 percent of all bony fish are restricted to either freshwater or seawater. They are incapable of osmotic regulation in the opposite environment. It is possible, however, for a few fishes like salmon to spend part of their life in fresh water and part in sea water. Organisms like the salmon and molly that can tolerate a relatively wide range of salinity are referred to as euryhaline organisms. This is possible because some fish have evolved osmoregulatory mechanisms to survive in all kinds of aquatic environments. When they live in fresh water, their bodies tend to take up water because the environment is relatively hypotonic, as illustrated in Figure 22.3a. In such hypotonic environments, these fish do not drink much water. Instead, they pass a lot of very dilute urine, and they achieve electrolyte balance by active transport of salts through the gills. 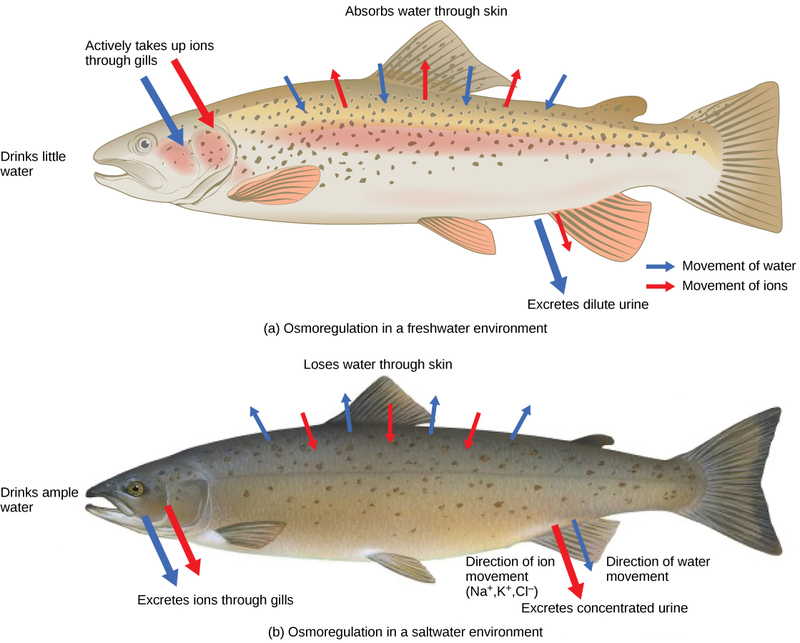 When they move to a hypertonic marine environment, these fish start drinking sea water; they excrete the excess salts through their gills and their urine, as illustrated in Figure 22.3b. Most marine invertebrates, on the other hand, may be isotonic with sea water ( osmoconformers). Their body fluid concentrations conform to changes in seawater concentration. Cartilaginous fishes’ salt composition of the blood is similar to bony fishes; however, the blood of sharks contains the organic compounds urea and trimethylamine oxide (TMAO). This does not mean that their electrolyte composition is similar to that of sea water. They achieve isotonicity with the sea by storing large concentrations of urea. These animals that secrete urea are called ureotelic animals. TMAO stabilizes proteins in the presence of high urea levels, preventing the disruption of peptide bonds that would occur in other animals exposed to similar levels of urea. Sharks are cartilaginous fish with a rectal gland to secrete salt and assist in osmoregulation. Dialysis is a medical process of removing wastes and excess water from the blood by diffusion and ultrafiltration. When kidney function fails, dialysis must be done to artificially rid the body of wastes. This is a vital process to keep patients alive. In some cases, the patients undergo artificial dialysis until they are eligible for a kidney transplant. In others who are not candidates for kidney transplants, dialysis is a life-long necessity. Dialysis technicians typically work in hospitals and clinics. While some roles in this field include equipment development and maintenance, most dialysis technicians work in direct patient care. Their on-the-job duties, which typically occur under the direct supervision of a registered nurse, focus on providing dialysis treatments. This can include reviewing patient history and current condition, assessing and responding to patient needs before and during treatment, and monitoring the dialysis process. Treatment may include taking and reporting a patient’s vital signs and preparing solutions and equipment to ensure accurate and sterile procedures. Solute concentrations across a semi-permeable membranes influence the movement of water and solutes across the membrane. It is the number of solute molecules and not the molecular size that is important in osmosis. Osmoregulation and osmotic balance are important bodily functions, resulting in water and salt balance. Not all solutes can pass through a semi-permeable membrane. Osmosis is the movement of water across the membrane. Osmosis occurs to equalize the number of solute molecules across a semi-permeable membrane by the movement of water to the side of higher solute concentration. Facilitated diffusion utilizes protein channels to move solute molecules from areas of higher to lower concentration while active transport mechanisms are required to move solutes against concentration gradients. Osmolarity is measured in units of milliequivalents or milliosmoles, both of which take into consideration the number of solute particles and the charge on them. Fish that live in fresh water or saltwater adapt by being osmoregulators or osmoconformers. 4. Why is excretion important in order to achieve osmotic balance? Excretion allows an organism to rid itself of waste molecules that could be toxic if allowed to accumulate. It also allows the organism to keep the amount of water and dissolved solutes in balance. 5. Why do electrolyte ions move across membranes by active transport? Electrolyte ions often require special mechanisms to cross the semi-permeable membranes in the body. Active transport is the movement against a concentration gradient. 22.1. Osmoregulation and Osmotic Balance Copyright © by laesoph. All Rights Reserved.